When it comes to choosing a lightbulb, you’re probably thinking, “Watts the big deal?” But it turns out there is more to it than just walking into the hardware store and nabbing something, anything, from the shelf. Today there are more types of bulbs than ever, and with the need for energy efficiency also at a premium, it is smart to pay attention to what you’re screwing into your fixtures. Read our primer now, and no one will ever be able to say you’re not the brightest bulb on the tree. Once upon a time, there was only one type of lightbulb. Today, you have many choices, but there are three main styles: halogen incandescents, compact fluorescent lamps (CFLs), and light-emitting diodes (LEDs). Halogen incandescents are the granddaddy of bulbs, and are slowly being phased out of production because they’re considered the least energy-efficient bulb on the market. However, they’re also usually the least expensive upfront, though their life span is substantially shorter. A regular incandescent bulb’s life span is a mere 1,200 hours. Why Aren’t These 9 High-Tech Home Features Standard by Now? CFLs are like the long fluorescent tube lights you might have in your office or garage, but in a curly, compact “pig’s tail” version. CFLs fit most fixtures designed for incandescent bulbs and use about 75% less energy while lasting about 10 times longer. However, they also contain mercury, so their disposal can be an issue. “Most people aren’t aware that if you break a CFL, it emits mercury and should be discarded and dealt with like toxic waste … making them a questionable choice for many homes, especially those with children,” says Tom Herstad, president of Regal Lighting Designs. Consumers should take advantage of free CFL recycling programs that are offered by leading retailers such as Home Depot and Lowe’s. It’s worth noting, however, that some companies like General Electric are phasing out CFLs in lieu of the next type of bulb. LEDs are a type of semiconductor that converts electricity into light and are literally the “coolest” bulbs on the market today (they use the least energy and produce the least heat). Residential LEDs, especially Energy Star–rated products (a demarcation for energy-efficient products created by the U.S. Environmental Protection Agency and Department of Energy) use at least 75% less energy, and last 25 times longer than incandescent bulbs (the average life span of an LED is 50,000 hours). 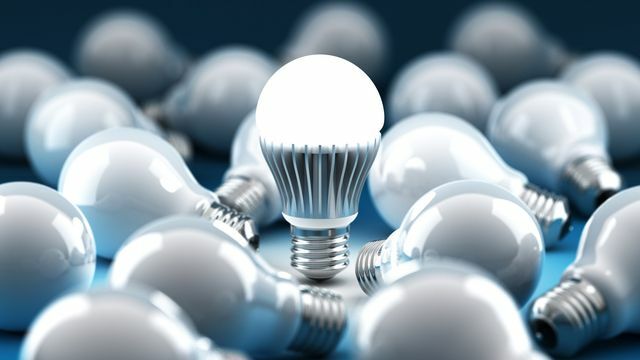 Though LEDs are more expensive at the outset, if every household replaced just one incandescent bulb with an Energy Star–rated LED, Americans would save more than $460 million in annual energy costs, and prevent greenhouse gases equivalent to the emissions of more than 550,000 cars. Plus, because LEDs emit less heat than incandescent lights, they’re a better choice if you’re trying to keep a room cool. LEDs are also preferred for showcasing valuable art, because they emit less heat and don’t produce ultraviolet or infrared light. To calculate how much wattage your room needs, try this formula: room length in feet X room width in feet = total area X 1.5. Also keep in mind that watts aren’t a measure of how brightly a bulb shines; rather, they’re a measure of how much energy it uses. Now that most bulbs are designed for saving energy, when you’re considering brightness, look for lumens instead of watts. Lumens measure how much brightness you’re getting from a bulb. To help you figure this out, keep in mind that a 100-watt traditional incandescent bulb gives you about 1,600 lumens, while a 40-watt bulb gives 450 lumens. Most lightbulbs are also labeled with lumens now, so look to this number as the true measure of how much light you will get. CFLs and LEDs come in different shades. According to Herstad, if you want to replicate the old yellowish-white light that a traditional incandescent bulb gave off, look for bulbs that are marketed as “warm white” or “soft white.” “Natural white” is the color of most ceiling lights in office buildings. “True white” is a shade of white that is very close to the color of natural sunlight when the sun is directly overhead; however, some people see blue in this color with LEDs. How do you know which color to select? Next Article BUY NOW WHILE INTEREST RATES REMAIN LOW!